As Frankfort, Michigan’s Beer Week (a northern Michigan microbrew festival) fades into the rear view mirror, we pick up a conversation with Stormcloud Brewing Company brewer Brian Confer about one of the more curious aspects of the fest, a tasting event that paired ice cream and microbrews. With trademark Confer honesty, he says, “I thought it would be disgusting.” But guess what. He forced himself into a state of open-mindedness and proceeded to mix and match and was surprised at how good some of the pairings tasted. We asked Confer to share some insight on the frothy, creamy, tasty mashup. Note: Listen to Jeff Smith, editor of Traverse, Northern Michigan’s Magazine and Brian Confer, brewer, talk ice cream and beer pairings with Norm Jones and Wendy on Tuesday’s Table with Traverse Magazine on WTCM’s Afternoon Drive show. So you were not optimistic about this endeavor. No. I didn’t think beer and ice cream would work. Every once in a while somebody comes in and orders a porter and ice cream float, but I never really tried that kind of combo. It sounded gross. What ice creams did you choose? We went to Hilltop Soda Shop in Benzonia. They hand make all their ice cream. If you haven’t tried it, you should. It’s really flippin good ice cream. I picked up like eight ice creams, a couple scoops of each. And Charla Kramer (a Stormcloud manager) and I just poured every beer we have and sat down with all of the ice creams and started tasting. So, you expected gross. Was it? Well, we’d guess what would go well when paired, and most of the time we were wrong. In almost every pairing, the beer that went with the ice cream was a surprise. The thing is, when the pairing did not work, it really didn’t work, like you wanted to spit it out. But then you’d hit the one that worked, and it was like, Oh my gosh, that is really, really good! Give us a couple pairings that worked. We have a black IPA and we paired it with the peach ice cream. It’s just unbelievable, just a great match. I don’t know how it works. Another, we paired a really citrusy sorbet with our Handsome Bee that was aged in a tequila cask. It was like flavors of a Marguerita. We paired butter pecan ice cream with our traditional Belgian-style Tripel, called 228 Tripel, and the creamy, nuttiness melded with that spicy note in the beer. So, should we be trying this at home? Sure. 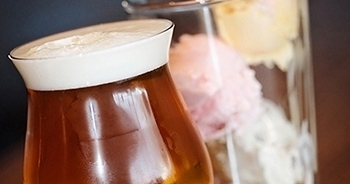 Sit down with some ice cream or cupcakes and all of your beer and figure out which ones work together. It’s fun to start with your assumptions and getting your mind blown when the one that you think would never work does.